Click. Click. The camera has captured another proud moment of a “special” woman’s life. I’m the woman in that snapshot, and I don’t know if I should feel proud about my birth. According to my mother, I didn’t give her too much pain. I even sucked her breast gently as if in fear that I might cause her pain. But later I did anyway. Like any new and excited mother, she expected me to grow up like other kids born in China of the 1980s: go to kindergarten at age three and then to school at seven; graduate from high school at 18, move on to college, find a secure job, have a family. With a stroke of fate all her expectations turned into a heartbroken reality. Three months after my birth I came down with a series of neurological conditions called cerebral palsy. Soon my fingers were clenched inward so tightly that the palms began to bleed. My arms became two twisted iron bars, my legs a pair of scissors, and my body as stiff as a Korean chopstick. The doctors who saw me agreed that I wouldn’t be able to speak, smile, or even recognize my parents. They suggested they send me away and go on to have another healthy child. Fortunately (and unfortunately in some ways), my parents opted for a road not taken and prepared to face the unknown. That included massaging my rock-like muscles, spending hours each day feeding me, looking for TCM (Traditional Chinese Medicine) remedies in the most unexpected small towns (some worked wonders for me), and losing sleep for a month because my spasms kept me awake. Education was something beyond the realm of their reasoning, but nevertheless they read stories to me unsure whether I could understand a word. All these early interventions took tremendous time and effort, but what change would they possibly make? This question never bothered my parents. They just did those things for the benefit of their child. They didn’t know that I would learn to speak at age three, begin to walk independently at 12, and write this essay at 32. By then I had already learned Chinese phonetics, a few hundred Chinese characters, and simple arithmetic with the cassettes and books my mother bought me. But my worry was not completely groundless. The headmaster of the local primary school only agreed to take me in as an “auditor”, the kind of attendance ineligible for full registered student status, after my mother begged him to test my intelligence. I was given a seat in some grade two class but was asked not to do homework or take tests. For a seven year old who craved learning, this treatment was nothing compared to sitting in a large classroom with other 30 children. The head teacher of that class was an old lady. She was kind and strict, and she knew what I needed. Arrangements were soon made so that I sat with a cute boy who helped me turn pages. When she found I was shy answering questions in class, she praised me for group recitals and my writings – yes, she asked me to do homework despite my auditor status. Alas, good things never last long. A few months later, she retired. In her place came a young and ambitious teacher who, like most teachers in China, cared a lot about the test scores of her whole class. As a result, I was moved to the back of the room to sit with the naughty and noisy boys. I was even forced to “contribute” my textbooks to officially registered students. Again, this meant nothing to an eight year old. My parents, however, decided to take me out of school because of this unfair treatment and my extremely weak immune system. After a tearful leaving-school party, I was forced to start a journey of self-learning at eight. The top of a sewing machine, an old chair, a battered window, and a clay-built wall outside the window that forever blocked the sunlight were my earliest study companions. Later came the computer and, much later, the internet. The last two proved most useful as I went through the primary and junior school curricula in about four years with two tutors, whom I visited once a week for Q&A and homework review. Technically, this was not the kind of home-schooling practised in the West. For one thing, there was no home-schooling support available in any form back then. For another, I still couldn’t take the national self-learners’ exams even if I moved on to the college level since no system was established to provide all the adjustments I needed to take the exams. Of course, I wasn’t aware of these restrictions at the time. I was just a lone and happy learner, taking delight in a Chinese literary piece, a mathematical rule, and anything that I could comprehend, or I thought I could. Learning was my hobby, the only thing of which I could take control with my mind. Soon, at age 16, I delved into one particular school discipline that would change my life (and my ego, too) for good. When I re-logged in the next day, I was astonished. Four stars followed the heading of my first post. More excitingly still, the moderator, David, and his sister Mary, replied under it! They showed their empathy and encouraged me to use English more. From that day a more focused learning plan was swung into action; I used all my waking hours speaking, reading, writing, listening to, and thinking in English. Two years later, someone on the forum asked me if I was a native English speaker. Canuck’s Comments was much more than a place I used to practice written English. It was where shared ideas and insights raised me to a level I had never imagined. I was no longer focused only inward. I began to look at the world outside my own and learned to absorb new (and sometimes dangerous) concepts such as human rights. I was still alone, but lonely I felt no more. I spent three more years as an ardent English learner. Then an unexpected referral by a friend’s friend pulled me into the field of translation. To be a qualified translator, you need not only language skills. Fast word processing, among other things, is required to meet often demanding deadlines. After years of medical treatments and physical therapies, I still can’t use my hands effectively. I have to control the computer with my toes. At first, it was difficult because of my tight muscles and coordination problems. But it had become easier with practice. My first real assignment was part of the construction bidding documents in English. It was not something you would read unless you work as a road constructor/manager. The wording looked alien and hard to render into Chinese. I ploughed on anyway. For the next seven days I worked over 12 hours a day. Just when I thought I had bitten off more than I could chew, I saw my life saver – some repetitions! In retrospect, I don’t think the quality of my work was up to par, but I finished the job on time. I received my first “bucket of gold”, 1,700 yuan – and one big canker in my mouth! I became more professional as I continued to take offers. Over the past ten years, I have processed millions of words/characters, including four published books on a range of subject matters. Of all the things I love about my career as a freelance translator, one is that most of my clients don’t know I have a profound disability. Working behind the screen provides me an outlet for fair treatment, defined by nothing but my own ability hidden in a disabled body. In the new millennium, China no longer shut itself up against what the nation used to call ”foreign devils.” Its reform and opening-up strategy ushered in a phase of unprecedented development. Outbound economic and cultural activities created an acute demand for linguistic services, and there I was, armed with outstanding bilingual skills and other qualities as a translator. (You wouldn’t think I was bragging if you got the chance to read English signs in a Chinese park.) To rescue my country from this crisis, all I needed were a blue leotard, a red cape, and maybe a qualifications certificate. Fortunately, I found that I could still easily keep my foothold in the Chinese translation market uncertified, thanks to its huge appetite for service people – and the lack of a robust system to produce them. IoLET is committed to equality of access to its examinations for all candidates regardless of gender, age, ethnic origin, nationality, creed, sexual orientation, marital status, employment status or disability. [A]ll persons associated with the examinations follow fair and just processes and procedures. Another longer document, Candidate Regulations, gives a list of adjustments available for candidates with special needs, including the use of a computer and the use of a candidate’s home as an Examination Centre. A few days passed. No answer. Just as I was about to give up hope again, Shirley sent me a positive reply. Better still, they had decided to exempt me from the usual invigilator costs in consideration of my “special status” as the first Chinese candidate who would be given special adjustments to take an exam at home. Finally, three adjustments were arranged according to the CIOL’s Candidate Regulations: 1) extra time allowance (25%); 2) the use of a computer; and 3) the use of the home as an Examination Centre. My DipTrans examination coincided with the launch of CIOL’s China Association in Shanghai. When my invigilator, Mr Wan Bo, arrived on 18 January 2016, he brought me some small gifts from the launch ceremony. Now I’m looking at one of them, a crystal cube with a paper clincher on its top. It still warms my heart whenever I look at it. The examination at my home began simultaneously with that at the China centre in Shanghai on 20 January at 9:30AM. Mr Wan unsealed the examination paper under Shanghai’s webcam supervision and laid the Unit One paper on a metal stand propped up against the keyboard drawer so that I could translate most effectively. The full DipTrans examination is a once-in-a-year event consisting of three units. They may be taken together or separately. In normal circumstances, three units take about seven hours to finish. In my case the exam stretched into almost nine hours. Despite Ela’s earlier advice that I should attempt two units the first time, I chose to take three units altogether in consideration of exam and home invigilation costs. By the time the exam started with Unit One, a general text about inequality, the sun hadn’t come out yet. I only slept two hours the previous night. To calm my nerves, I told myself I was just working for a translation agency as usual. The only difference was that I had to disable my network connection and instead use a paper dictionary, which I had borrowed from a friend. Earlier in the DipTrans training sessions, I found I had difficulty turning pages with my feet. But I found the solution soon: a pair of Yoga socks with small rubber particles at the bottom and without toe parts. The increased friction and the freedom to use my toes separately were perfect for me to look up words in a traditional dictionary. I already felt like an expert linguist of the old times! But it was still a laboured process compared to how fast I could check words online. Finding words in alphabetical order was not easy for me either, as I repeated the alphabet in my mind over and over in order to locate a letter. In the end, I had to print out “my ABCs” and hang it on the wall for a little more efficiency. Seeing how I combatted the dictionary, Mr Wan offered to help. I declined, though, not wanting to have any adjustment that gives “unfair advantage over other candidates”, as warned by the Candidate Regulations. There is a fine line between “I can’t” and “I find it hard” after all. When I finished the last unit, it went well past eight at night. My earlier “illegal” practice as a freelance translator put me at ease during this long exam; I was able to finish each unit on time. Under Mr Wan’s invigilation, I printed out my translations on A4 sheets with official headings stating the candidate’s name, number, and the name of the unit taken. With the last piece of paper rolling out of the printer, I realised that I had finally made it. It’s not so much about how I did in the exam. It’s about how much I enjoyed the process, how much I wished I could be “normal” again, having access to a level playing field and getting credit for what I can do, rather than what I can’t. Standing before the camera at this “Special Exam Centre”, I know my dream has become true. Thursday, 19 May 2016 at 7:43PM, I got a Wechat message from Shirley. I read it and then let out a cry. A second later, tears were gushing down my cheeks. My parents were terrified. They hurried to my side and asked what’s wrong. It took me a while before I could talk. Then I heard myself stuttering: “The e...exam...I .. I p..passed it!! !” Later I learned that out of a dozen or so Chinese candidates who took the full exam, only three passed the three units all at once. From this is easily seen the rigidity of DipTrans evaluation. In August 2016, I received the full Diploma in Translation – my first qualification certificate! A look at its red official seal reminded me of the wonderful experience. But there is more to it than a paper proof of personal qualifications. In a broader sense, it testifies a universal, often-forgotten truth: Life is a test. When you’re too restricted to try, you will lose the possibility to get what you want for yourself. For “special” people like me, a well-designed system, as my case exemplified with the UK’s DipTrans exam, is much needed to break as many barriers as possible on physical, social, and educational fronts. One of the indicators that show the real strengths of a civilisation is not the rising GDP, nor its foreign investment, but the way less advantaged residents are empowered to make the impossible possible. I’m proud to say that China has made remarkable progress over the past 30 years in this regard, but obviously it still has a long way to go. Last but not least, I thank the Chartered Institute of Linguists and its China Association in Shanghai for this amazing experience. I also hope that my story will be the first of many that show how things could be done to improve accessibility at various educational levels in my country. I thought my experience with CIOL’s DipTrans was completely over until Shirley told me otherwise – that a week later on 24 November I would be awarded the Regional Coordinator’s Trophy for Best Candidate at the first annual general meeting (AGM) of the CIOL China Association in Shanghai. Considering my health as well as the great geographical distance to the coastal city, she suggested making a video of me talking about what I thought of the whole process I went through as a special candidate in the 2016 exam. The video would be played at the award ceremony. This could have been a brilliant idea if my hyper-reactive brain had not rendered me an all-time foe of mics and cameras. I also wanted to be physically present at the meeting, to feel all that could be seen and heard, to be in real time and space with everyone who was lucky enough to be there. It could be another special moment in my life, my first time to attend a public event of high academic stature as I had dreamed for years. “We can also make it a holiday and family visit!” My parents exclaimed, looking much prouder than I was. One of my cousins, Steven Hu, and his parents, live in Shanghai. When I told him we were coming, he volunteered to pick us up at the Hongqiao International Airport, despite the clash against his duty to chaperon his daughter from school around 4pm. Amidst all the skyscrapers and accompanying neon lights the ride to my uncle’s apartment seemed quite uneventful. Then, from the radio came a musical piece that sounded familiar. I listened on. I had heard it several times before, but this time at a turn of the notes I felt a jolt in the stomach. As the musical progressed, I allowed the feeling to grow stronger. It was a painful sensation, almost like seeing your favorite TV character die a meaningless death, or losing something you hold dear to your heart. Immediately I was taken back to the days when I was supposed to prepare for my DipTrans exam, which already seemed like a lifetime ago. I have lost what I believed to be my confidence in starting my own family with disability. For one thing, my neck starts to play up after long years of spasms and unbalanced use of muscles. I face the danger of being paralyzed from the chest down and yet no non-surgical treatment can be applied due to the spasms. For another, my boyfriend must leave China to address his own health concerns. Two weeks earlier I thought I had all the joy in the world being a busy freelance translator and a bride-to-be. Now I slumped back into a mire of despair, unable to work or physically help a man in need of a healthy meal I wanted to cook. So dreams were made, used, wasted. There was no ransom to be paid. I am lying in bed. Lie still! Don’t move! Every part of my body screams, but my brain is a traitor. My neck, whose 21cm incision is still raw and fresh, jerks back and forth. Each jerk brings a sharp pain and a new wave of fear that a screw might come loose from one of the seven spinal bones fused together to protect the spinal cord. The face-up position is too uncomfortable for me to get any decent sleep. Daytime is worse: I can’t sit before my laptop for twenty minutes without feeling drained. It’s been four months since I was told I had passed all three units of the exam and two months since the neck surgery, and I can’t do anything. I used to dream to get internationally accredited as a translator so that I could reach overseas clients. I used to imagine kissing my man when he leaves for work every morning. Now those dreams dim like a dying amber. In my cousin’s car a storm raged against my chest and I was trying hard to keep it off my eyes. I am not a musical fan; nor do I think I have genes for music. But on very rare occasions a melody would touch some mysterious part of my heart and affect me so. This was such an occasion. I wonder if it’s because of the music itself or a recalled memory. The next day my parents and I arrived early at the SFSC building where I would receive the CIOL’s Best Candidate award. We were first greeted by Shirley and her colleagues in the hallway. (She looks prettier than on the mobile phone screen.) Once in the conference room I found myself surrounded by new faces. One was the owner of a graceful lady in qipao. She was introduced as Ms Lam, the CIOL’s coordinator in Hong Kong. Beside her stood a tall, blond woman; from the agenda I had learned that she is Jane Galbraith, Head of Membership at CIOL. They both greeted us cordially and led us to our seats. Jane and I had a pleasant, homey conversation, topics ranging from our families to the prospect of human translators/interpreters being replaced by smart algorithms. Florence, the lady in qipao, volunteered to interpret between Jane and my parents. More people began to stride in half an hour later, all greeted by Jane and Florence. Most of them are leaders in the fields of foreign language studies and education. Suddenly the room sprang into life brimming with voices. I sat there looking to my left and right and left again, sometimes catching a few words like “we are partners, don’t we”. I saw people smiling, waving, moving their lips, shifting in their seats. A few men looked in my direction and then tilted their heads toward neighbouring seats. I also noticed that to my father’s left sat another award-winning candidate. I was able to hear a few snippets of his conversation with Jane, but we sat too far apart to talk. I became a tourist in Disneyland, both attracted to and distanced from such exciting sights and sounds. The meeting started at 2.00pm and went as scheduled. It involved award ceremonies for 2016 DipTrans candidates in China and the CIOL Cup translation contest for Chinese college students. What impressed me the most, as I had expected, was not the moment when Shirley the host announced the Best Candidate’s name, though I truly felt honored to ask Jane to hold the medal for me. The best part came from the discussions earlier, led by Victor Deyglio, the Founding President of the Logistics Institute based in Toronto, Canada. My favorite topic: If you were to use one word to tell your student translators, what would it be? The comments that followed bore no concept at a level of sophistication otherwise deemed appropriate for the participants’ high academic status. But I was intrigued and laughed in all the right places. Obviously I had worked alone at home for too long to remember why I loved my career. Now in this room I was reminded of various answers both to my and Victor’s question: responsibility, faithfulness, creativity.... Other topics were also as tasty as the dinner to which we would be invited after the meeting with the people my parents never dreamed of seeing. (I’m sure my father won’t get tired of telling anyone who would listen that his daughter dined with a dean of Fudan University!) Altogether they made me think our travel costs were not wasted. One of the highlights of the AGM was Jane introducing the CIOL’s new membership policy. The other highlight – no bragging – fell on me and my family. 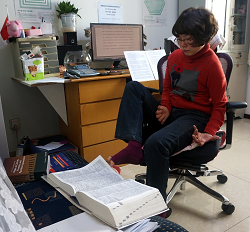 Before leaving for Shanghai, I had known that my status at the meeting would be an award-winner with cerebral palsy, someone who looks so different from other people, an attraction by definition. Indeed, I could see that in the eyes of a few Chinese attendees. Throughout my life, I have been seen differently because of how I move and talk. Perhaps this is one of the reasons why I can identify with Les Misérables. Like Jean Valjean, I was forced to accept an identity enslaved in certain social norms, over which I have no control. I can’t tell this man to change the surprised look in his eyes which clearly suggests, “What’s wrong with her?” Nor can I walk away from that security guard who questions my intelligence just by one look at me. Here in this conference room, it’s the other way around. My short, impromptu (and a little disoriented) acceptance speech drew a thunder of applause louder than that of a college student winner who talks in English so much better than I do. My father’s speech made everyone grab tissue paper. I should have felt proud, but my stomach gave a few uncomfortable churns as if I were being stared different. Inwardly I asked: Who am I? Jean Valjean was sentenced to a 19-year imprisonment for a loaf of bread he stole for his dying nephew. I was sentenced to lifelong disability because of some virus I contracted before I had memory, language, or thought. But the storyline does not stop here; rather, it is shaped by what happens next. Jean met a caring priest, the only man who, unlike the others before him, planted a seed of love by showing kindness to the thief. “Who am I” was a cry of redemption from the human soul struggling in the world of injustice. Who am I? I asked myself one more time. It was not until the AGM had its group photography that I glimpsed a cue. The photographer asked everyone to take the photo on a flight of stairs down in the lobby. Seeing that I have some difficulty walking up the stairs, Jane from the crowd reached out to help me. When it was over, Victor, the self-claimed “trouble maker” who showed keen interest in my father’s story, walked to my side and offered his elbow for me to take as support. These and other small gestures from the AGM attendees reminded me of Jean Valjean again. Stealth as well as cerebral palsy is a fait accompli that cannot be changed regardless of any moral implication derived from within. It has been engraved into the general perception of and by the subject and will be carried on until he or she dies. What can be changed is the human heart. Yes, life can be unfair. Yes, life can be tough. But life can also become a blessing if it’s endowed with equality, kindness, and care. This is the universal language that needs not to be translated and can alone make a better place for people like me and Jean Valjean. The best part of my agenda came next morning, when Shirley and another lovely girl, Amy Wang, took me to their weekly post-graduate “Translators in Practice” class for MTI students at Fudan University. The lecturer of the week was Pan Weimin, a Chartered Linguist who leads the Foreign Language Studies Department at Shanghai University of Electric Power and who made a keynote presentation at the AGM the previous day. If you asked any of my much younger “classmates” about the class, I’m sure you would get a positive answer. Dr Pan is among the fun professors I’ve known; he can easily explain a key point through laughter. But if you ask me, I would add that this was the most special class I ever attended – and the first class I sat through at a university, not at my computer desk, in a field I’ve known for over a decade. Before the class, I was presented an author-signed copy of Lu Gusun’s Chinese-English Dictionary (Vol 1) by a beautiful lady I met earlier at the AGM. Lu Lian is the associate dean of the College of Foreign Languages and Literatures, Fudan University. Then Dr Pan gave me a copy of one of his own books. He signed it for me, too. But the most significant of all was in class, where I recalled the importance to be an observer in translation. After lunch, Shirley and Amy offered to be my campus guide – well, they tried to be like one at least. It felt liberating to walk among hordes of young bicycle riders, to listen to birds chirp over the large expanses of greenery, to imagine academic legends staged in those ancient buildings. Suddenly my vision blurred, and I had to blink the tears away. A flourishing academia like the one I visited always lures me, but it never belonged to me. What have I missed? Would I have been far more accomplished if I had studied here? Would I have lived in my dreams had I not been condemned to the never-ending confinement of a physical reality in which I am struggling? Then a courageous song started to grow louder and louder in my ears.